The Underwater Homeowners Association sounds like a sad joke about the future of real estate in flood-prone Miami. It’s actually an earnest effort to turn neighbors into climate-change advocates, block-by-block. Cortada repurposes “for sale” signs, painting partially submerged numbers that announce exactly how many feet above sea level each property is, for people to plant in their front yards. A growing number of members have signed on at underwaterhoa.org since Cortada launched the idea in December. Cortada’s signs show his home is on relatively high ground: 6 feet above sea level. His studio is at 8 feet. Rising seas will spare no one concerned about quality of life in Pinecrest, a village of 19,000 not far from Biscayne Bay. Like the rest of South Florida, it’s trapped between the ocean and the swampy Everglades, which act as a western coastline. Water also rises through Florida’s porous bedrock, making seawalls and levees less effective. It runs along what constitutes high ground in South Florida — a narrow coral ridge that appears to stay dry when models of sea level rise show much of the region inundated. 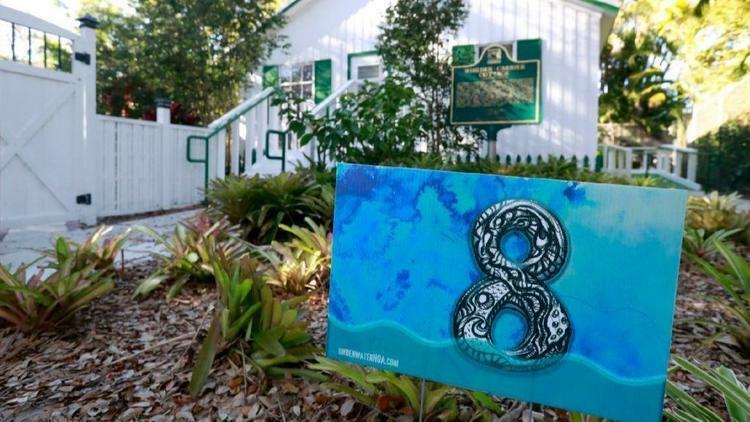 Some residents aren’t happy about these art installations, warning on a community newspaper’s website that the signs and pavement could devastate property values. “Does anyone seriously want this in front of the expensive homes in Pinecrest? Maybe they won’t be so expensive once they convince the world they will be underwater in a few years,” one wrote. Whether people like their neighbors’ politics, global warming is already affecting homebuyers here, where average seas could rise 6 to 10 inches by 2030, and 14 to 26 inches by 2060, compared with 1992 levels, according to the most recent data from the Southeast Florida Regional Climate Change Compact. Other projections show saltwater rising another foot by the time a new 30-year-mortgage is paid off, and 2 feet by the time today’s schoolchildren retire. Long before then, intruding seawater could wash away infrastructure, submerge public spaces and make even a trip to the grocery store difficult to navigate. Cortada worked with Florida International University to create Eyes on the Rise, a website that shows the elevation of any address. Then he partnered with the Florida Conservation Voters Education Fund to help people understand how they might get involved. Renters are welcome in the Underwater HOA. There are no dues or other requirements. The main idea is to encourage neighbors to discuss climate change among themselves. What happens next is up to each group. Actions could include creating plans for individual households, doing climate education outreach, attending government meetings or lobbying elected officials. As property values rise along higher elevations, low-income people who remain above water fear they’ll be priced out of their homes by wealthier people fleeing once-desirable coastal neighborhoods. Cortada’s inaugural Pinecrest group has met twice so far, led by Brian Haus, an ocean-sciences expert at the University of Miami. Their February meeting stuck to local water issues: the number of city residents still using well water, the lack of fire hydrants in some areas, whether sewer lines could extend to residents using septic tanks. They don’t want to leave Miami — hurricanes are easier to endure than wildfires or ice storms, they said — but some caution against sinking too much time, energy and money into shoring up what could become a waterlogged burden. “Sell the house when I’m gone and get out,” some said they told their children. “I like that the Underwater HOA is flipping the script on what a traditional HOA actually stands for, which is mostly people standing around with pitchforks at the ready,” said Zickler, who lives at 9 feet.